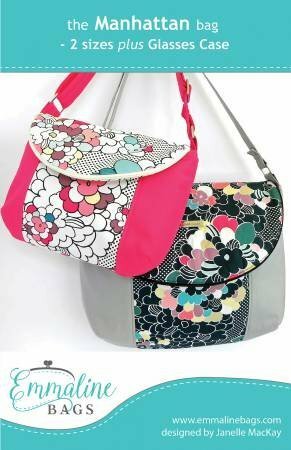 The Manhattan Bag pattern includes instructions for a gorgeous shoulder bag in 2 sizes (Mamma & Miss), as well as additional instructions for a Removable Case for eyeglasses, sunglasses, or other items. The Manhattan is extremely fun to make and very unique, because the front flap actually zips open along it's edge! Why? So you can put cool stuff in it!! I have included instructions for the aforementioned Removable Case and this actually sticks into the flap with (optional) velcro and is, wait for it, removable! This case is perfect for your glasses or sunglasses.